In this photo, a group of late 1950s/early 1960s Hoffman-Boston high school students examine a relic on display at the Museum of Natural History. Do you remember Rosslyn Ten Pin Bowl or A & H Plumbing Supply CORP.? 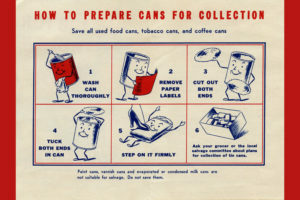 This colorful advertisement from 1943 describes how to properly clean and prepare tin cans for recycling in order to aid war efforts during WWII. 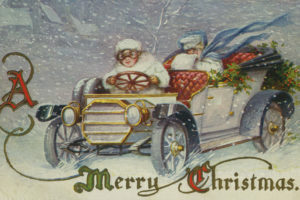 Did you know that the study and collection of postcards is called Deltiology? Do you recognize the white building with columns in the right side of this photo?